Japan will host the Rugby World Cup 2019, the Tokyo 2020 Olympic and Paralympic Games, and the World Masters Games 2021 Kansai. A total of 30,000 domestic and 20,000 international athletes are expected to participate in the World Masters Games 2021 Kansai. However, little is known about constraints and constraint negotiation among such sport tourists (i.e., masters athletes). 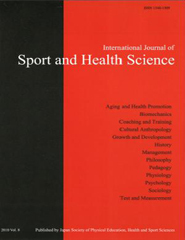 Therefore, the purpose of this study is to investigate the constraints and constraint negotiation experienced when Japanese masters athletes participate in domestic and international masters games. Semi-structured interviews were conducted with five Japanese masters athletes who had participated in both domestic and international (outside of Japan) masters athletic games and who belonged to the prefectural Masters Athletics Association. Thematic analysis of the transcribed data was conducted in an inductive manner. Our results indicated that: (a) time, physiological, and masters-game-specific constraints exist in both domestic and international contexts, while financial and travel constraints exist only in international contexts; (b) family, time, financial, and psychological negotiation exist in both domestic and international contexts; and (c) constraints and constraint negotiation may differ depending upon the nature of participation in the masters games (i.e., the level of involvement and social orientation).